Dehorning is the removal of the horns from cattle. It is a labour-intensive, skilled operation with important animal welfare implications. Cattle can have horns of different length, shape and size, but all horns are detrimental to cattle from a welfare and production perspective, and pose a potential safety risk to cattle handlers. Bruising costs the Australian beef industry over $30 million each year – equivalent to $4 for every beast slaughtered. Evidence indicates that the single major cause of bruising is the presence of horns. Potentially more hazardous to people. Tipping (removal of the insensitive sharp end of the horn) is not dehorning. It does little to reduce the disadvantages of having horned cattle, for example it does not reduce bruising, and tipped cattle can still be a danger to other cattle and handlers. Good hygiene is very important to prevent infection after dehorning. Dusty yards, wet days, dirty equipment, high fly activity are all factors which lead to infection. Equipment should be placed in a bucket of water with antiseptic, in between animals. The water should be changed frequently. All equipment should be cleaned thoroughly after use. The younger the animal at the time of dehorning, the better it is for the animal and the easier the job for the operator. There is less pain and stress for the animal and there is less risk of infection or fly strike the smaller and younger they are, particularly if they are going back to their mothers. Smaller animals are also much easier to handle and restrain. Removing horns from older cattle, yearlings and adults is time consuming, painful for the animal and increases the chances of a setback. It is not recommended to dehorn animals over 12 months of age unless undertaken by a veterinarian and is illegal in some states and territories. Dehorning is not recommended when an animal is in poor condition, or if it has other health problems. In this case the animal should be dehorned when it is in better health/condition as it will heal more quickly. 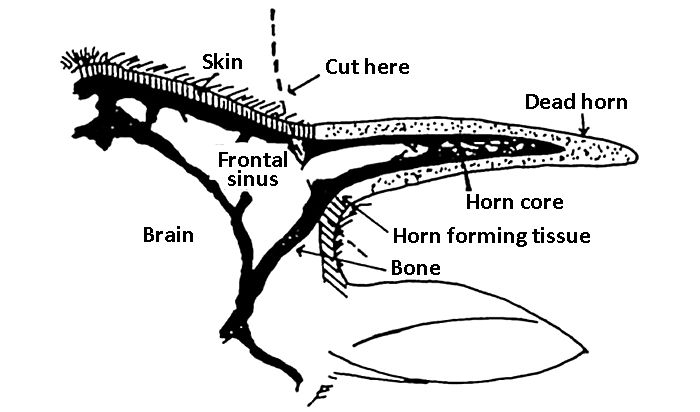 The horn core is a bony extension of the skull and the hollow centre of the core communicates directly with the sinuses of the skull. The horn grows from the skin around its base, just as the wall of the hoof grows down from the skin of the coronet. To ensure no horn regrowth, it is essential to cut away 1cm of skin around the base of the horn. The method of dehorning should be matched to the size of the horn and the age of the animal for optimum effectiveness. The key to successful dehorning is the removal of a complete ring of hair (~1cm wide) around the horn base. The level of skill of the operator and personal preference for a particular method will also be a consideration. There is no one method for a particular animal age or horn size. The dehorning knife has a curved blade and is easy to use. The procedure is very quick and has shown good results with no regrowth if the job is done properly. It is essential to take around 1 cm of hair around the horn bud. The knife must be kept sharp. You can dehorn calves from two weeks to about six months of age without exposing the sinus cavity (leaving a hole in their head after dehorning) as they can still have a loose, unattached horn bud. Once the bud has grown solid to the skull a small scoop dehorner may be a better choice. 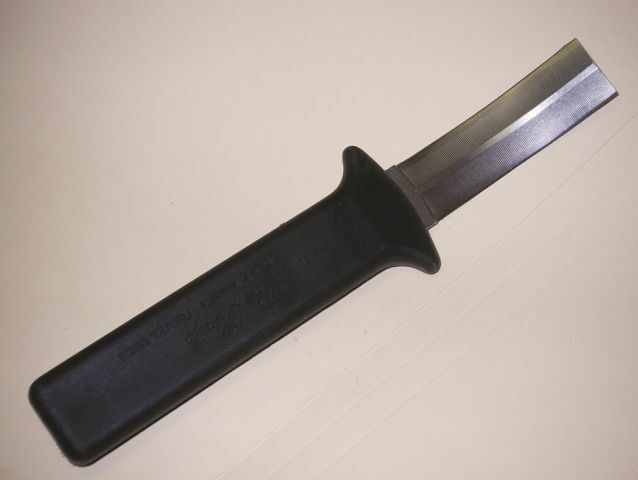 The dehorning knife will give excellent results with practice. The use of dehorning irons does not result in an open, raw wound. 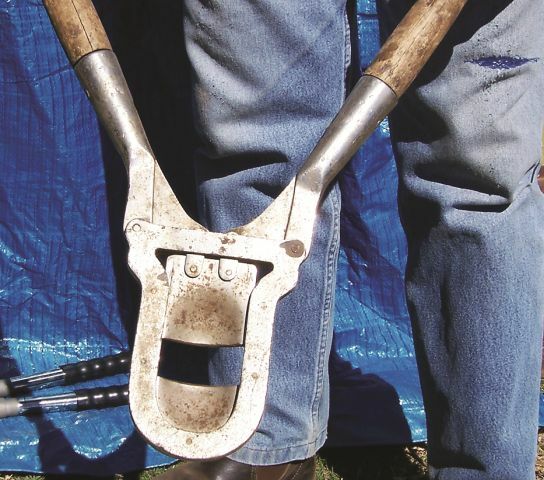 Dehorning irons are made like number ‘O’ branding irons and can come in a variety of sizes but usually have a diameter of 50mm. The hot iron is placed over the horn bud and the surrounding tissue and twisted a few times. This technique ensures that the blood supply will be seared off and the horn bud area will die and drop off. This technique is limited in its use when dehorning a line of animals as it is only effective on certain size horn buds. They are ideal for intermediate aged calves. Scoop dehorners are used by passing them vertically down the horn and pushing the handles outward thereby scooping out the horn. As with other methods the head of the animal must be well restrained. 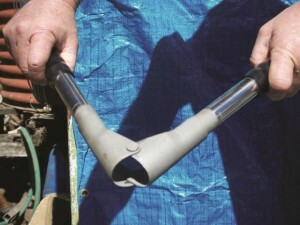 Scoop dehorners come in a number of sizes and it is important the right size instrument is used on the appropriate animal. The larger size scoop dehorners can leave a deep hole if used on too smaller animal, but are useful for weaners and older cattle. Calves that are too big to dehorn with a knife, hot iron or scoops can be dehorned with cup dehorners, which will handle cattle up to 12 months of age. Again it is necessary to take a complete ring of skin around the horn base. Guillotine dehorners, surgical wire, horn saw and tippers are used on adult cattle with larger horn growth and should only be used for tipping. Horn saws, parrot teeth tippers and surgical wire should only be used to tip the horns of adult cattle i.e. remove only the insensitive part of the horn. 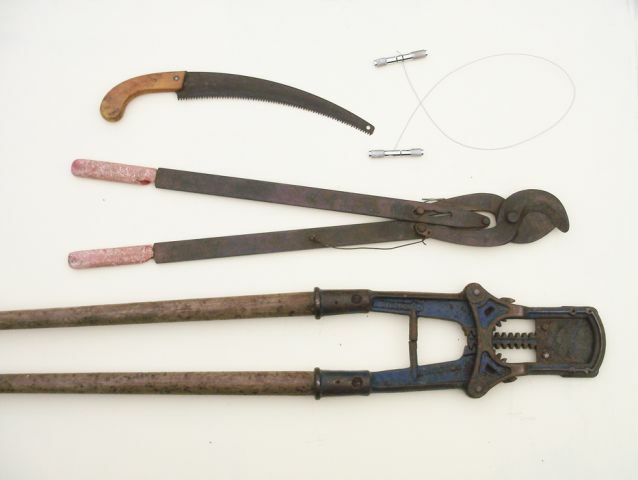 If used to remove more horn, or dehorn cattle, these instruments should then only be used by a veterinarian, or under the direction of a veterinarian. Local anaesthetic should be used. Dehorning cattle over 12 months of age is not recommended and is illegal in some states. Tipping as compared to dehorning does not reduce bruising. Animals bleed freely after dehorning. This is normal and helps to clean the wound. Fly strike is a problem when animals have an open wound but if dehorning is carried out in a hygienic manner, wounds heal up quickly. Do not apply an insecticide straight on the wound, but rather around the wound. Wound disinfectants can be applied to the wound to reduce infection risks. Avoid leaving animals in the yard after dehorning. Put dehorned stock onto good nutrition. To learn more about correct dehorning technique recommended reading is A guide to best practice husbandry in beef cattle: Branding, castrating and dehorning (PDF, 3MB) a free Meat & Livestock Australia publication. You may also be interested in research into ‘Accelerating healing of calf frontal sinuses exposed by dehorning’ (PDF, 390KB) conducted by Geoffry Fordyce, Helen McMillan and Nicky McGrath (published 31 January 2014) available from Meat & Livestock Australia.